Tackle tough trenching jobs with the trencher attachment. Cut into the ground and create a trench through all soil conditions. The trencher is designed with the power and strength to dig in even the toughest, rocky soil types. Use the side-shift feature – manual or hydraulic, depending on the model – to dig a trench close to buildings, fences, and other objects. Equip the trencher with different teeth and chain options to maximize trenching capabilities in different soil conditions. The easy-to-use trencher attachment is built for improved trench digging and greater reliability on the jobsite. The trencher is the ideal attachment for maintenance crews, municipalities, landscaping contractors, and rental facilities. Light-to-medium trenching jobs: The LT112, LT113 and LT 213 deliver 2- to 3-foot dig depths. 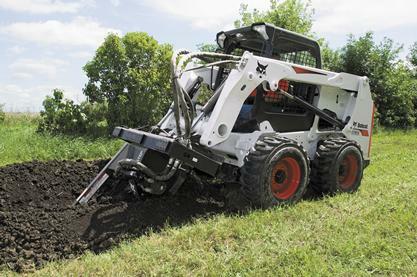 The LT112 and 113 feature manual side-shift for trenching close to buildings and other objects, while the LT213 may be equipped with optional hydraulic side-shift. Medium-to-heavy-duty trenching jobs: Ideal for utility installation, the LT313 delivers a 3- to 4- foot depth and the LT 414 delivers a 4- to 5-foot dig depth. The LT313 features manual side shift is standard and hydraulic side-shift is available. The LT414 features hydraulic side-shift as standard for trenching close to buildings and other objects. The LT414 is equipped with high-flow performance capabilities to harness the additional hydraulic horsepower capabilities of the machines equipped with high flow hydraulics. Heavy-duty trenching jobs: The LT405 delivers a 3- to 5-foot dig depth, and features hydraulic side-shift for trenching close to buildings and other objects. The LT405 is equipped with high-flow performance capabilities to harness the additional hydraulic horsepower capabilities of the machines equipped with high flow hydraulics. Dual augers move spoil away from the trench. Multiple Chain Styles Available: All trencher chains are double standard, anti-back flex (ABF) to provide superior constant performance. Look at the options tab to see the multiple different chain configurations offered to suit your needs. Auger: Designed with a large diameter, the auger moves material from the side of the trench, limiting the amount of spoil falling back into the trench. Grease Cylinder Tensioning: Quickly and easily adjust your train to the proper tension. Crumber: Standard on each trencher model to help remove soil from the trench and provide a clean, smooth trench bottom. Reverse Rotation: All trencher models are capable of momentarily reversing the chain direction to minimize stalling. Narrow Frame Width: LT112 – LT414 are narrow enough to fit into a pickup box to make transportation easy.